The Arlington Estate in Virginia was built between 1802 and 1817 by George Washington Parke Custis, grandson of Martha Dandridge Custis Washington. Custis built the home in honor of his foster father, George Washington, and he filled the house with memorabilia of our country’s first president. In 1831, George Custis’s daughter, Mary Anna, married her childhood sweetheart, Robert E. Lee, in the Arlington House parlor. The house was so big that George and his wife, Mary, moved into the north wing of the structure and offered the rest of the home to their daughter and new son-in-law. The Lee family truly made Arlington House their home; six of their seven children were born there. On April 17, 1861, the Commonwealth of Virginia seceded from the Union, and five days later, Robert E. Lee took command of the Virginia militia. While traveling with the southern forces, Lee left the responsibility of caring for the Arlington Estate to his wife, Mary Anna. According to records of the time, Mrs. Lee owed $92.07 in property taxes. As part of the tax law, Mrs. Lee was required to pay those taxes “in person,” but her position and responsibilities made that impossible. As a result, the Lee-Custis Arlington House was officially confiscated by the U.S. government. One month later, Union forces seized and occupied the Arlington House. The home served as the headquarters for Gen. Irwin McDowell and his Army of the Republic. With battles raging between northern and southern forces in the nearby Virginia countryside, Union Quartermaster Montgomery C. Meigs was charged with finding an area of land suitable for burying fallen soldiers. Meigs ordered burials to be made at the newly-confiscated Lee property. In this new cemetery, a Monroe County man was the first person to be laid to rest. William H. Christman was born October 1, 1844, in Lehigh County, Pa., and was the second son of Jonas and Mary Christman. According to the 1850 census, William and his family moved from the Lehigh Valley north over the Blue Mountains and settled in Jackson Township, Monroe County. By 1860, the family had once again migrated north and had established themselves in Tobyhanna Township, Monroe County, where they remained. Jonas and Mary Christman had eight children: Barnabus, William, Anna Maria, Emeline, Mary, Timothy, Sophia, and John. With the start of the Civil War in 1861, William’s older brother, Barnabus, traveled to Stroudsburg and enlisted in the 33rd Regiment, Company F on June 11, 1861. Barnabus served just more than one year in the Union army. He was killed in action on June 30, 1862, at the Battle of Glendale in Virginia. With the death of his brother and because of his father’s failing health, William briefly took on the responsibilities of the Christman household. However, the war continued, and William decided to volunteer for the Union Army. He traveled to Easton where he enlisted in the 67th Regiment, Company G and was mustered in as a private on March 25, 1864. William Christman was 20 years old. Records indicate that William received a total of $300 as a “signing bonus.” Of this, $60 was paid in advance; the remaining $240 was to be paid in installments. For his service, Christman was paid $13.41 monthly; he also received a one-month advance of this salary. Wanting to provide for his family, Christman sent money home to Tobyhanna Township so that they might be able to buy land for a farm. Enlistment papers offer physical details about Christman. He stood 5 feet, 7 ½ inches tall, had sandy blonde hair, gray eyes, a reddish complexion, and a scar on his neck. The members of the 67th fought in a number of battles during the Civil War. The regiment was active through the end of the conflict, being present at Appomattox Courthouse when Gen. Lee surrendered to General Grant April 9, 1865. Unfortunately, William Christman would not live to see that day. deploying other Union soldiers, transporting Confederate prisoners, and maintaining supply lines. On April 22, 1864, Christman fell ill. Eight days later, he was admitted to the Lincoln General Hospital and was diagnosed with rubella or measles. The Lincoln General Hospital, which had 2,575 beds, was a large military hospital built to serve soldiers during the Civil War. As many know, more soldiers lost their lives from diseases caused from or spread by unsanitary conditions than from battle wounds. Pvt. 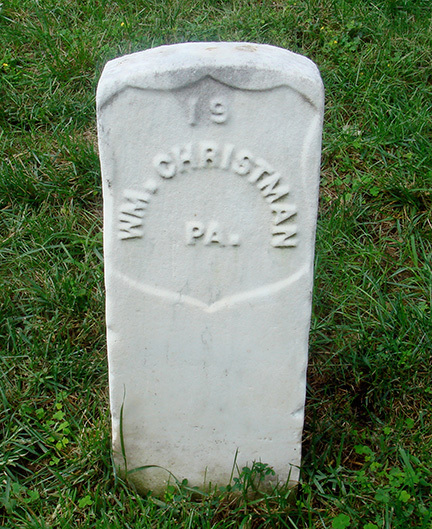 William H. Christman was buried on the grounds of the Arlington Estate on Friday, May 13, 1864. It is not known how he was chosen to be the first person interred at Arlington National Cemetery. While there were other interments that day, Christman’s was the first of the first day’s burials. While Christman did not experience a battle during his enlistment for the Union army in the Civil War, his dedication to his country is to be commended. This Memorial Day, as we reflect on the thousands of men and women who died in service to our country, we can remember a young man from a Monroe County working-class family that made the ultimate sacrifice and had the honor of being the first person buried at Arlington National Cemetery. Interestingly, the heirs of the Lee family inherited the Arlington house and estate, and they believed that the property had been taken in an illegal and vindictive move by the U.S. government. They took their case to the U.S. Supreme Court in 1882. By that time, more than 16,000 soldiers had been buried at the Arlington Cemetery. The Supreme Court sided with the Lee family, and the Lee’s accepted an offer by the federal government to purchase the property for $150,000, the fair market value at the time. After the sale, the United States became the owner of the land with the cemetery with a free and clear title. Assistance with the information for this article was provided by Rick Bodenschatz of the Historical Association of Tobyhanna Township. For a complete history of William H. Christman and the other soldiers from Tobyhanna Township who fought in the Civil War, please visit www.TobyhannaTwpHistory.org.